MADD London now has a scholarship program available to student volunteers to give them more meaning to their community involvement. Beginning in 2017, one (1) scholarship of $2,500 will be awarded to the applicant with the highest score in honour of Catherine Newton (see further details below). Additional scholarships in the amount of $1,500 may also be available. Winning applicants may not reapply in subsequent years. Criteria: MADD London’s scholarship program is open to all actively involved student volunteers who are enrolled in a full-time, Ministry approved, post-secondary educational program. Catherine Newton (March 1, 1977 – August 24, 1997) was an A+ student while attending Western University with the goal of becoming a physiotherapist working with children. One of her gifts was her amazing ability to connect with children – she loved them and they were drawn to her. 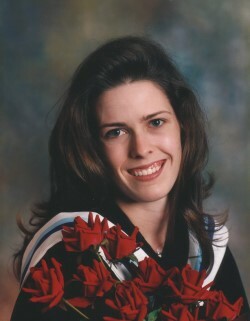 She had a bright future ahead of her; however that dream was shattered when Catherine was killed by an impaired driver. After an evening out with friends, she was crossing Richmond Street in London when a pickup truck went through the red light and struck her on the pedestrian crosswalk. She died a few hours later of her injuries. She was just 20 years old. Catherine was kind, caring and fun to be around. She had a multitude of friends and was always there to listen and to offer support when they needed her. In a memorial tribute, Catherine’s friends described her as follows “Whoever was lucky enough to be a part of Catherine’s life experienced her positive influences and strong family values. Her personal values were an important aspect of her life and she never lowered herself below what she firmly believed. If given the opportunity she would extend her family and its values to anyone her life touched.” Her life was short but it touched many. The Catherine Newton Volunteer of Excellence Scholarship in the amount of $2500 will be awarded to one student each year who strives to have the same leadership, dedication and compassion that Catherine Newton demonstrated in school and in life.